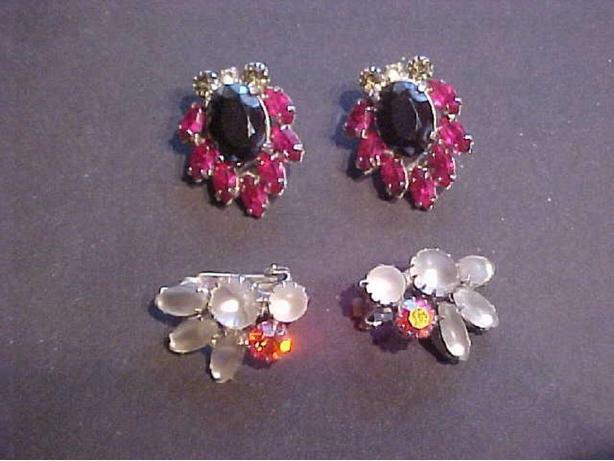 THESE GORGEOUS CLIP ON EARINGS WERE MADE IN CANADA BY CONTINENTAL. THEY DATE FROM SOME TIME AROUND 1960. BOTH PAIRS ARE IN EXCELLENT CONDITION WITH NO STONES MISSING AND LITTLE WEAR. ALL THE CLIPS ARE FIRM. THE PICTURES DO NOT DO THEM JUSTICE. FOR OTHER ANTIQUES, VINTAGE COLLECTABLES AND ITEMS OF HOUSEHOLD INTEREST PLEASE VISIT MY OTHER ADS.